I’m in Alice Springs, a town in the Northern Territory. I lived here for a few years a while ago and now I’m back here for work. Much has changed, much has remained the same. The town is framed by the McDonnell Ranges (I think I’m obliged by the Northern Territory Government to add the adjective “magnificent” before their every mention) but the real heart of the place is the Todd River. As the town has developed to the east, north, west and south the river is more than ever the environmental hub that provides the Alice with its focus. 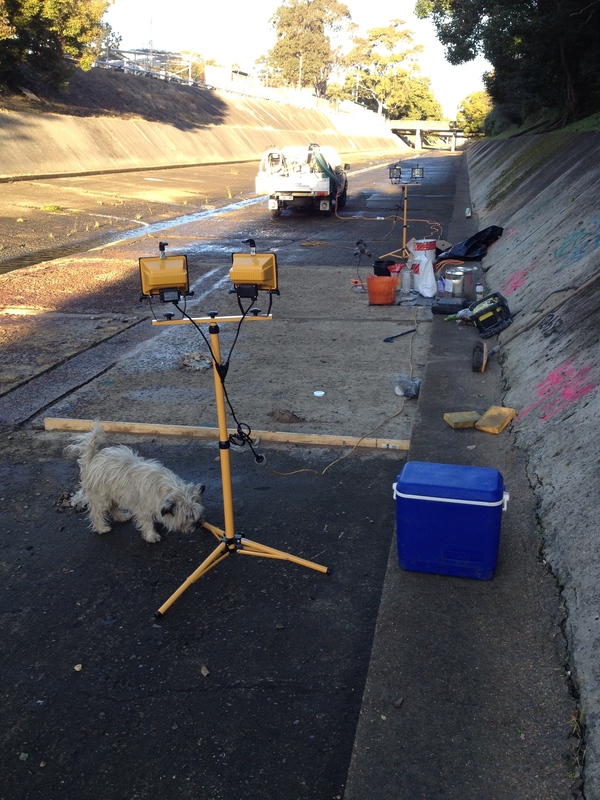 Newcastle’s waterways are generally either tidal or only ever flowing at capacity after rain. 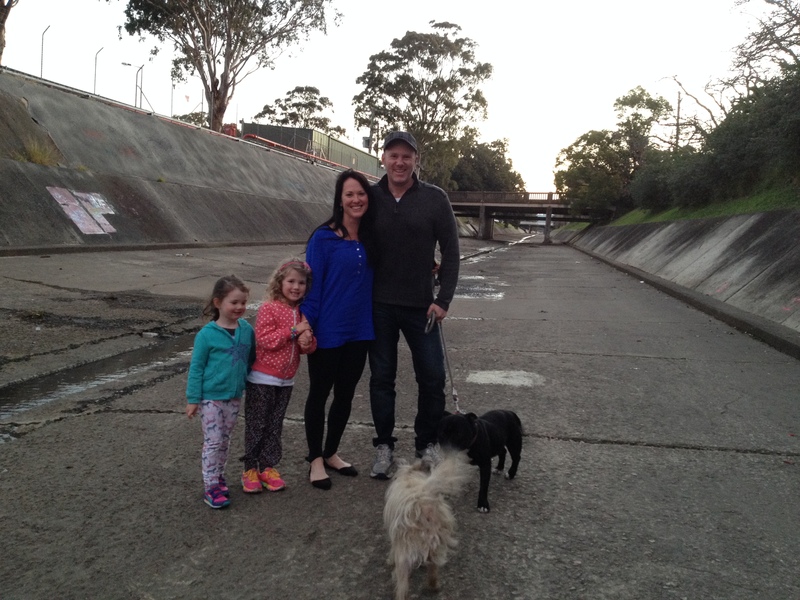 The Todd, unlike Newcastle’s waterways, is a peopled environment. Don’t be fooled by the snake-like coolings of tyre tracks; they are not made by the vehicles of people who live here, but by the police and the night patrols. As Mr Hockey recently pointed out, if you’re likely to be living in a creek bed then you’re unlikely to be worrying about increases in fuel excise. 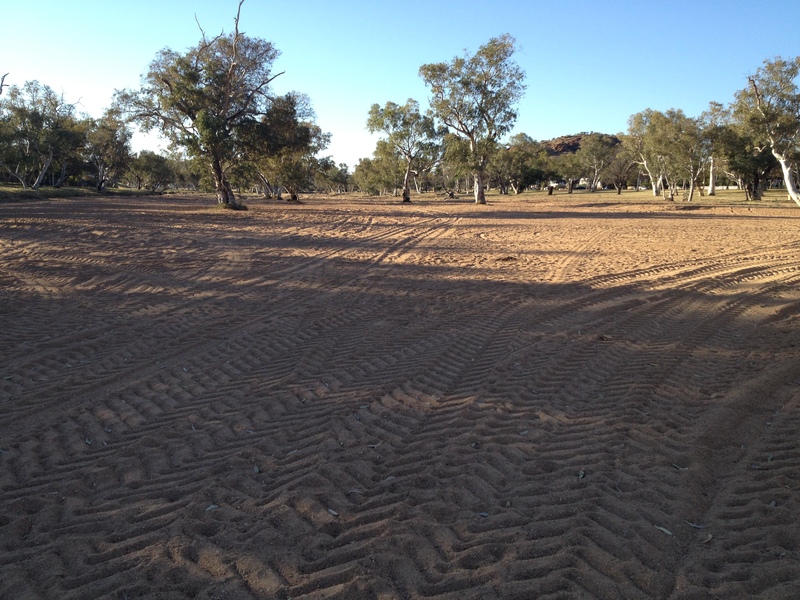 The Todd is, for the most part, entirely dry with a bed of gritty, dusty sand. But there’s more to this difference between the two types of river than just “wet versus dry” / “concrete versus sand”. At some point in Newcastle’s recent past we stopped peopling our waterways. Here, each river red gum stands like a small island of activity. 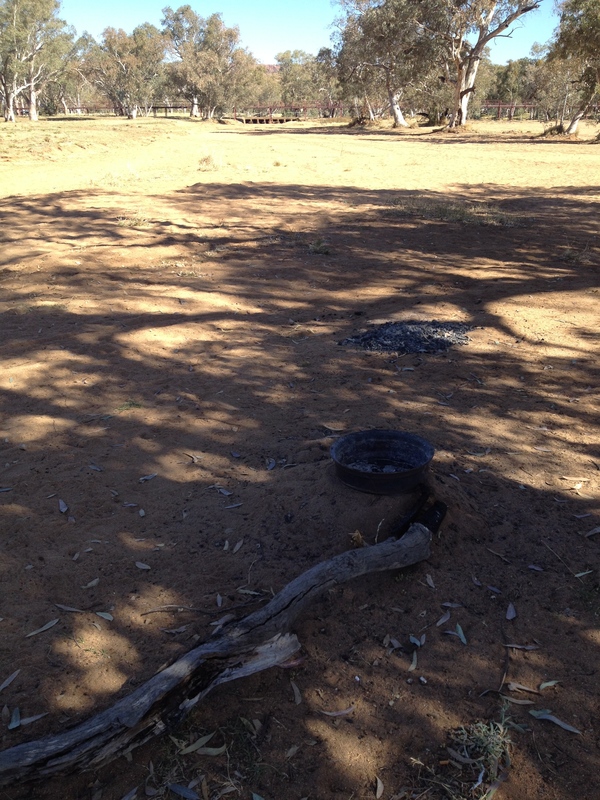 People scatter during the daytime but return at night to the small, scuffed fireplaces (or, in this case, makeshift camp oven from a half wheel hub). I’ve written before about people who, in our lifetime, remember swimming in the Styx and lazing on its grassed, sandy banks. The endless channelling and straightening, the concreting and fencing, the erection of “Danger!” and “Keep Out!” signs has resulted in a disconnection between the people and the water. Your correspondent has temporarily taken off to the Red Centre. It’s a bit dry around the traps at the moment. When rain does come it can come in ferocious downpours that thunder off the rocky hills that surround the town. 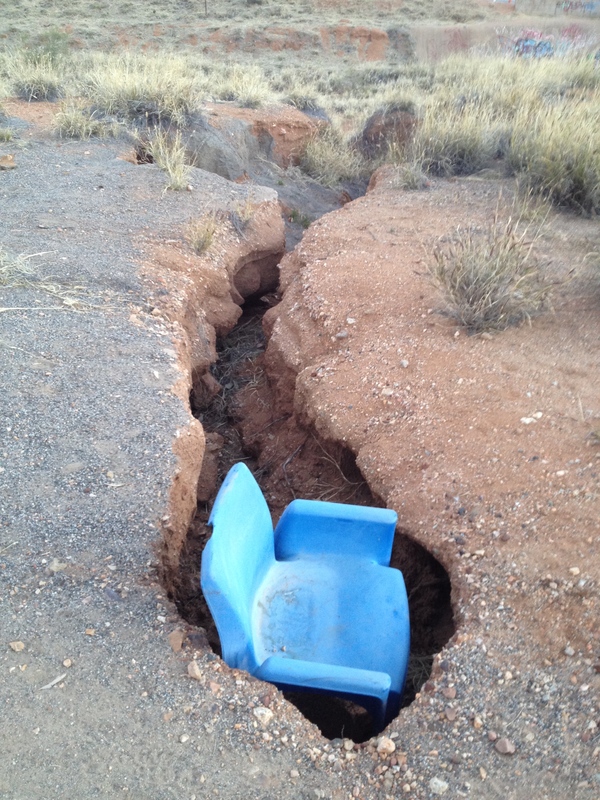 I came across this on the outskirts of East Side; perhaps its an ironic postmodern installation, “Visiting Chair in Erosion Studies”. Men are considered to be very literal creatures, poor at multi-tasking and generally in need of clearly articulated instructions with ‘real world’ outcomes. I was reminded of this when strolling around the post-industrial back blocks of Clyde Street, a strange nether-world of neither-here-nor-there-ness. 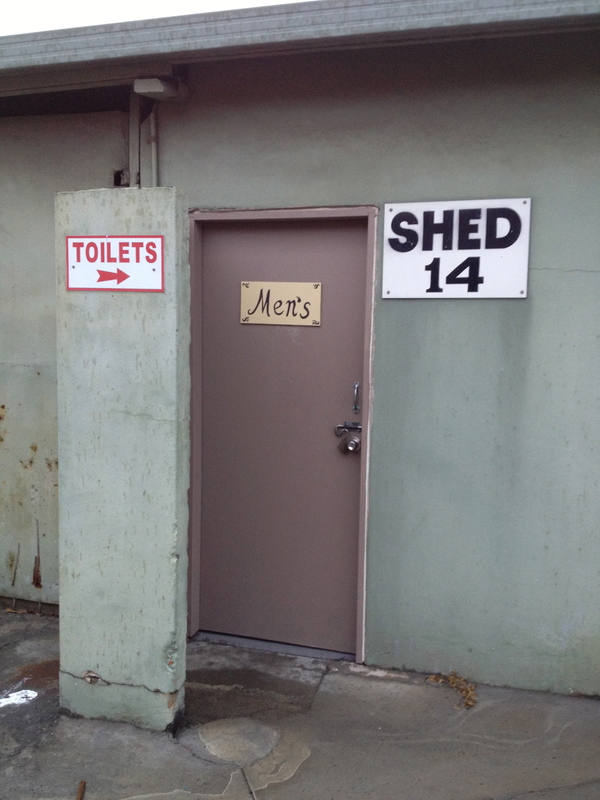 That’s Shed 14, guys! The one with the arrow and the words “Toilet” and “Men’s” on it. Not behind the fig trees, OK? Some years ago the cub reporter at the Centralian Advocate was despatched to cover the local Crafts Council’s annual exhibition. Looking at the rows of crochet work and the felting, the yards and yards printing and knitting, the cub began her article with the immortal words “Hours and hours of tedious work went into this year’s annual Alice Springs craft show”. I was reminded of that line when I saw the guys fixing up the creek next to the gasworks. It’ll take a long time and a lot of work before they even know exactly how much time they have to spend and work they have to do. 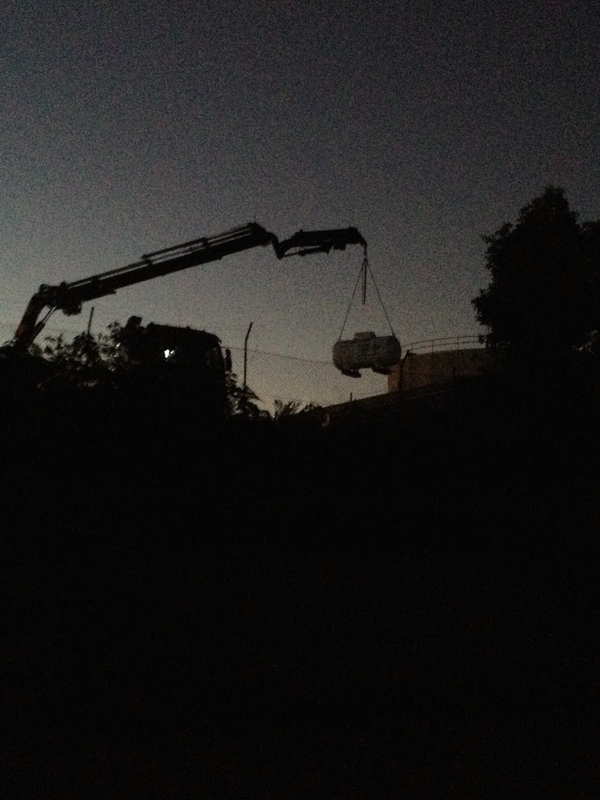 The ELGAS mob moved out at the end of June; there were a few late nights with cranes and trucks but then, one day, there was no KOFM wafting across the creek in the early morning. 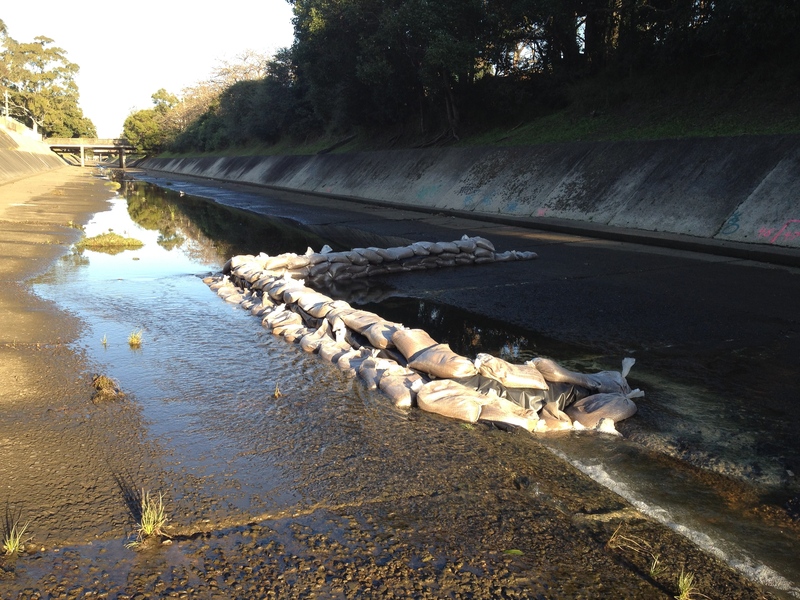 A section of the drain was sandbagged off while they fossicked around. I don’t claim to have any understanding of the science behind the process (I assume it’s related to the monitoring that’s been carried on over several years by the EPA) but, out of all the possible places to start working, this was where it began. If you look downstream from the Chatham Road bridge you’ll see them down there most mornings. Because of the time of year they only get a wee bit of sunshine before 7 am, then the sun disappears behind the trees on the northern banking. It must be bloody cold work. As I say, I’m no scientist and I’ve no idea what they’re actually doing. All I know is that it involves drills and probes and some goo getting pumped underneath the concrete, then all the cracks sealed up. When I asked about the process I was told by a young lad that it was “environmentally friendly”. I had to suppress a smile; he was so nervous and guarded and had been told “If anyone asks, tell them it’s environmentally friendly. Especially if it’s some nosey old git with a terrier”. I hardly expected him to say anything else, I just wanted to know what the process was. Never mind. It took them about three or four weeks to do one section of slab. At this rate they’ll be there all year; I mean, look at that Grand Canyon-like fissure. In the words of the Centralian Advocate‘s cub reporter, they’ve got hours and hours of tedious work ahead of them. I saw a young lass jogging, proper jogging, with all the proper jogging clothes on, heading upstream from Islington. I got a cheery wave from a fella bedding down for the night in the small triangle of grass formed between the junction of the Styx and the drain and fuel depot. I bumped into Isaac, who’d just watched a goshawk seeing off a brown falcon. And then I met Richard and Rebecca and the girls, out for an evening stroll. 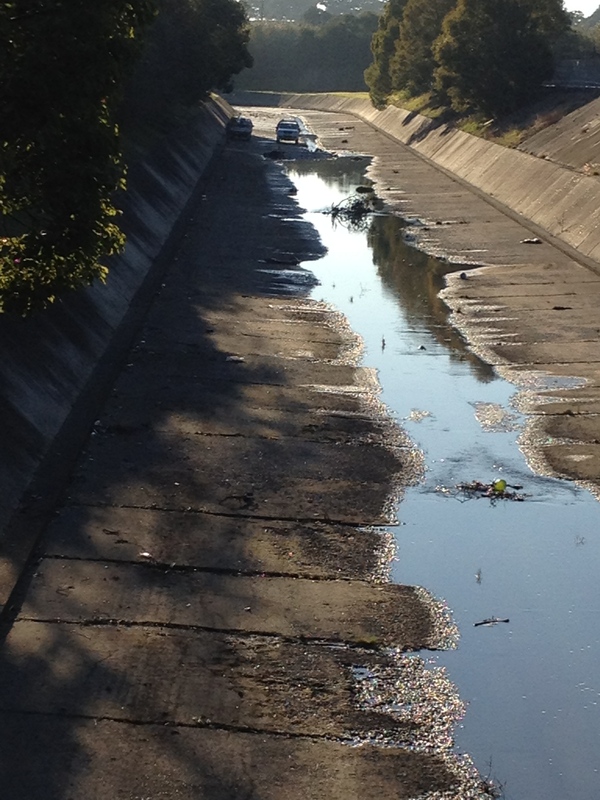 The drain: it’s better than the park, better than the dog beach, better than the jogging track. When I was a lad (How’s that for a start? Settle in. ), the midday meal was ‘dinner’ and the afternoon meal was ‘tea time’. When I say that dinner was at midday I mean exactly midday: 12 noon. Tea time was at 5 o’clock. Which left a hell of a long time before tomorrow’s breakfast. What did we do? We had supper, of course. I don’t know if it’s just because I’m all modern now, or a bit middle class, or living in Australia, but I don’t get to do the supper time thing much any more. I used to look forward to a bit of toast or something with a milky drink at 9 o’clock – though never cheese or bananas, which (it was widely acknowledged) cause bad dreams. But on dusk last Sunday I found someone out for a bit of supper. It was late in the day, the sun dipping towards the Indian Ocean. 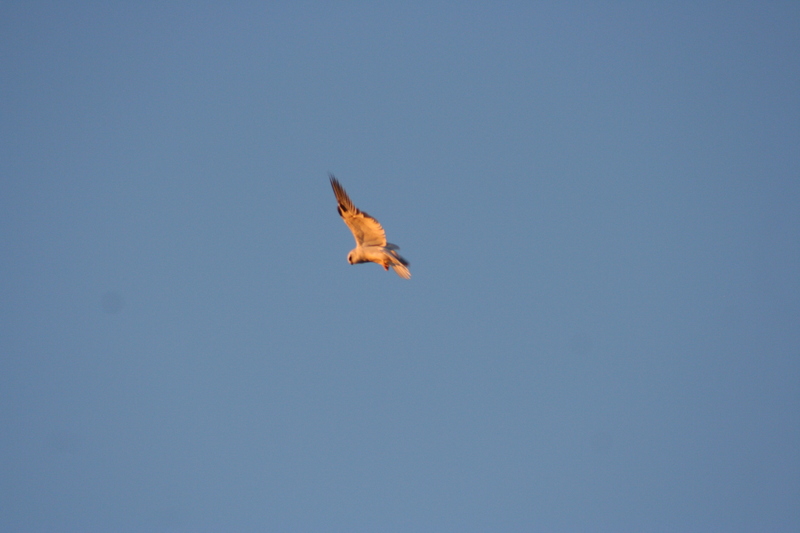 Its last rays lit up this black-shouldered kite above the gasworks. 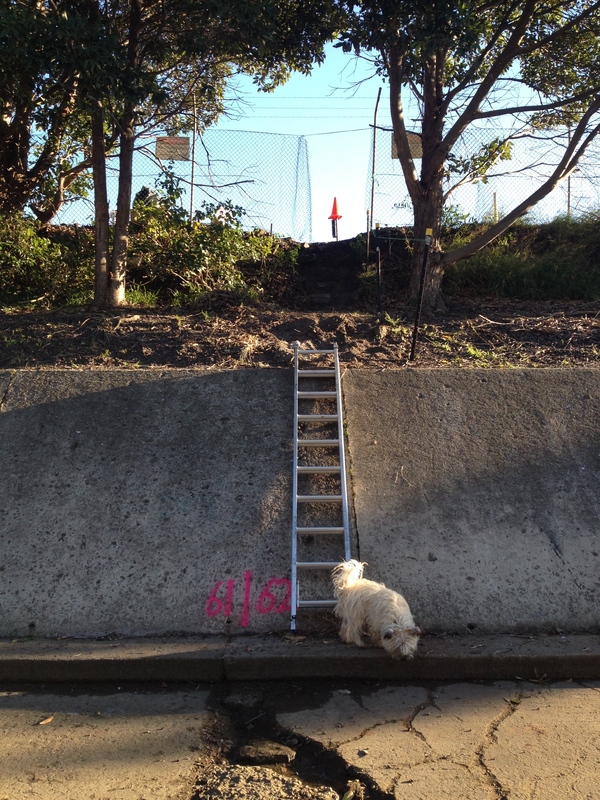 And off he took with his bit of supper to his favourite power pole, the one next to the drain by the railway bridge. And there he sat, filling his belly till tomorrow’s breakfast, as the super moon in all its brilliance crept up from the Pacific Ocean to shine down on us all. I was about to post a different Friday Foto when – BANG! – along came this absolute corker from Ruth Cotton, which trumped everything. The photo is captioned “Broadmeadow & Boreas Rds, Hamilton Nth, N’cle, 10.06.1950”. 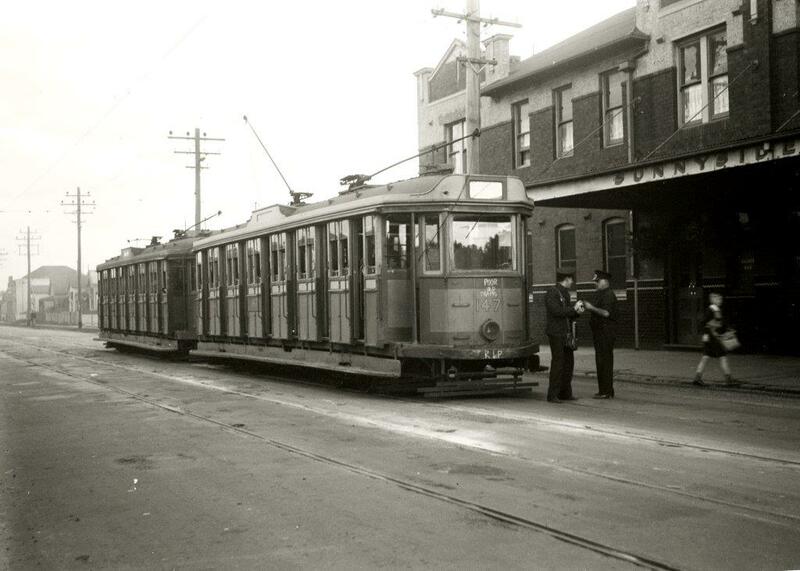 It was taken just next to the Sunnyside Tavern by Noel Reed, who appears to be something of a legend in his recording of public transport in NSW. 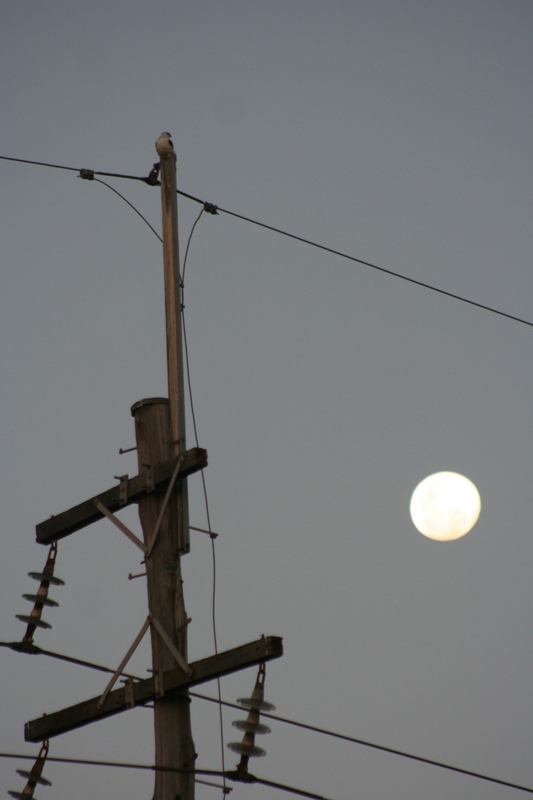 You are currently browsing the Hamilton North, NSW 2292 blog archives for August, 2014.